This story relates to an employee that my father recruited and gave a chance, despite being told by a number of sources that this man would let him down…big time. This man, Peter, was 25 years old, with a wife of 24 months and a new baby just 6 months old. Peter had been sacked from his last two jobs. The latest was from a role as a storeman at the local newspaper, and my father had encountered him there when he purchased his butcher’s paper from the company. Peter had been in this position for 18 months, and was dismissed for what his manager described as lack of respect and general tardiness. Being desperate for a job to support his family, he reached out to my father for a position in the butcher’s shop. Dad had liked his personality and dry humor in their previous encounters, and said he would consider his application to train as a butcher. When doing the reference checking, his previous boss advised dad strongly not to hire him, citing that Peter had no respect for authority and refused to do allotted tasks. On checking with his boss in another previous job, the result was much the same, and included claims of absenteeism and a punctuality problem. Dad, being open, honest, and forthright, confronted Peter. He denied the lack of respect, saying that his manager was demanding, overbearing, and had forced Peter to do tasks that he felt were not in his job description. Peter admitted that in the role prior to that he went through a wild time and had taken a few sick days and been late on a number of occasions. Dad then went to see the previous boss and he stated that Peter was a “bad egg”–very difficult to control, impossible t o motivate, possessed of bad manners, and lacking respect for his superiors. After due consideration he got Peter in again, three times over the next week: once abnormally early, once in the evening, and once specifically for 10 minutes at 10:20 a.m. He did this to check punctuality and desire, as Peter had to ride his bike over 30 minutes to attend the interviews. He passed this test, and Dad went over with him the issues raised by his previous manager. Dad listened intently, without judging, as Peter blamed the manager’s style without taking any responsibility for himself. He said no one respected the manager, that he was regarded as extremely tough to please and a hard taskmaster. At these meetings Dad explored Peter’s dreams and if given the role obtained his commitment to work under Dad to improve not only his work skills but his life skills as well. It was explained to Peter that this would be tough, the training would be three times a week for an hour prior to commencing work. After weighing things up and without offer of a job, Dad stated that he wanted Peter to work for two weeks on no pay to assess his suitability for the job. Peter agreed without even thinking about it, as he said he felt that Dad would teach him to be a great butcher and, more importantly, to be a great husband and father. This was the key that Dad had been looking for–Peter taking some responsibility for developing himself–and he offered him the role there and then. Peter worked for Dad for 10 years before opening his own butcher’s shop…that was his dream! He described Dad as tough and unrelenting but with a huge heart, the one person in his life that he looked up to, as Dad brought the best out in him. Peter told me this story at my father’s funeral. The moral of this story is you do not have to be soft as a manager in order to gain respect. 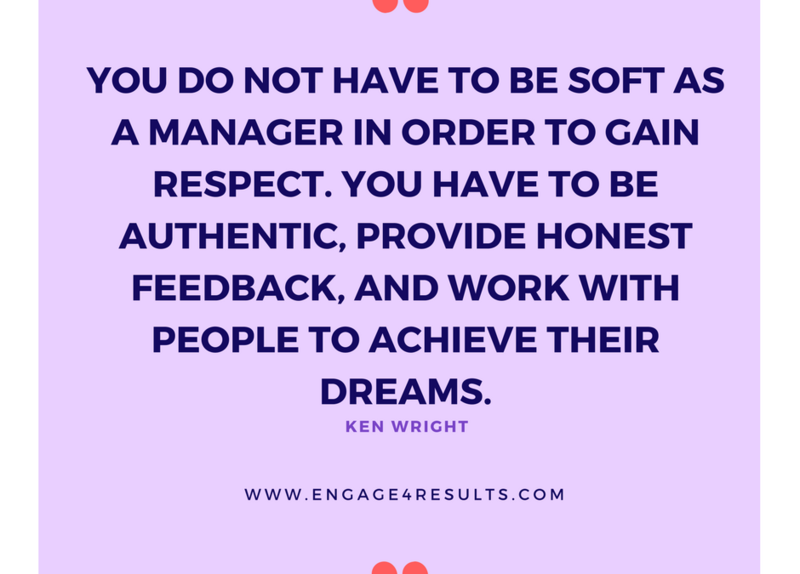 You have to be authentic, provide honest feedback, and work with people to achieve their dreams.